We were watching the butterflies this morning, but didn't see any sign they were thinking about laying eggs. I've been reading more about this stage in the butterfly lifecycle, but haven't found anything that described the length of time between mating and egg laying. None of the butterflies where showing any interest in the nice little garden we created with thistles and borage. So it didn't seem like they were ready. 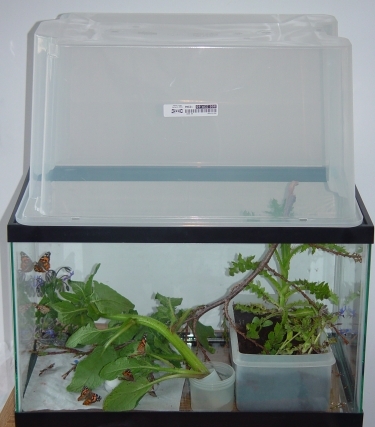 About this point, I did find a source that said each painted lady butterfly could lay up to 500 eggs! There was no way there would be enough room on those plants for that many eggs! We decided it was time to get some more leaves in so that everything would be ready when they needed it. There really wasn't space for a large plant with lots of leaves and an extensive root system. The plant would probably stay alive if the stem was in water, but you have to be careful the butterflies can't fall into the water. We found an old, plastic film canister that was big enough for a borage stem and some water, but not so big that the butterflies could fall into it. Of course, the plant is huge compared to the film canister, so it would just topple over as soon as I put in down. We put the film canister into a larger, plastic cup. That give it a bit more stability, and seemed like it would work. We put it into our butterfly habitat. The butterflies noticed it immediately. They completely ignored the little garden, but they are climbing all over the borage leaves. In fact, we saw the first egg about 5 minutes after the plant was put in. They must have just been waiting for something to lay their eggs on. Here are some pictures of a butterfly laying an egg. First, look at the picture on the left. 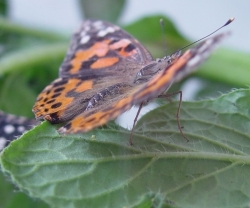 The butterfly's abdomen is almost touching the leaf, but there's nothing on the leaf. Next look at the photo on the right. 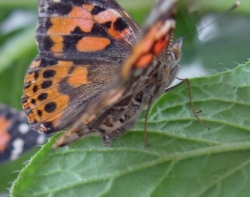 You can see the tiny white dot that is underneath the butterfly at the same spot where the abdomen touched the leaf. I've read that the eggs are the size of a head of pin, these eggs are smaller than the head of a pin. Here's a close-up on a leaf with some eggs. 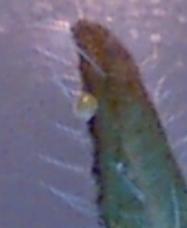 That section of the leaf is about 2 inches (or 5 cm) wide. The butterflies have been very busy laying eggs everywhere. My son has been counting and he can see over 50 eggs. There are a lot more than that! Here are some pictures of the eggs taken with our digital microscope. The eggs are a beautiful, pearl color. I was amazed to see the interesting shape of the eggs. Here's an Amazon link to the type of microscope we used to take the photos. This page contains a single entry from the blog posted on May 17, 2008 10:19 PM. The previous post in this blog was Butterflies Mating. 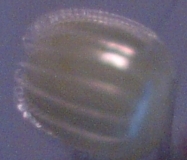 The next post in this blog is Hatching Larva.